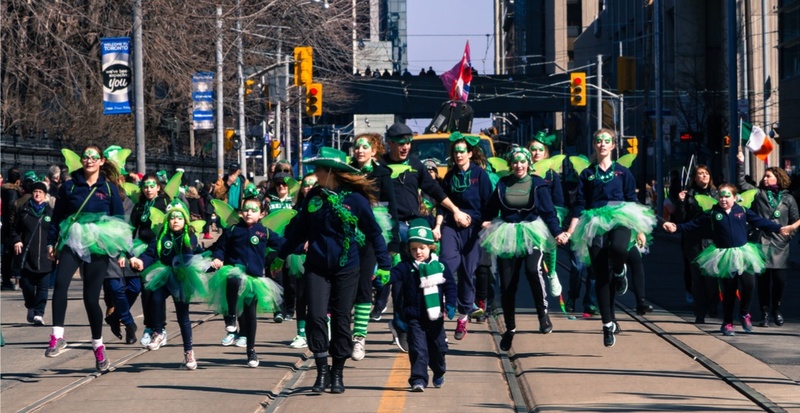 It’s almost St. Patrick’s Day, which means the big Parade is taking place downtown Toronto this weekend. And this Sunday, March 11, from 8 am to 3 pm, the TTC will be diverting a few routes to accommodate for the parade. – 5 Avenue Rd buses will turn back north at St George Station, diverting in both directions via Avenue Rd., Davenport Rd. and St. George St.
– 94 Wellesley buses will divert in both directions via Spadina Ave., College St. and Queens Park Cres. – As the parade proceeds west on Queen Street, 501 Queen streetcars will divert eastbound using McCaul, Dundas and Parliament Sts. back to route, and divert westbound using Broadview Ave., Dundas and McCaul Sts. back to route. The map below shows the exact diversions and the parade’s path. And next weekend, Jameson Irish Whiskey is helping Torontonians celebrate St. Patrick’s Day safely by providing free transit from 4 pm to 2:30 am on the 501 Queen, 504 King and 514 Cherry streetcar routes. Get out there and celebrate! There are lots of options to choose from. Don’t forget, there’s also a major TTC closure this weekend.